In 2018, numerous corruption scandals were exposed that demonstrate how the political elite in Papua New Guinea are unlawfully enriching themselves and their cronies at the expense of the majority of the population. Manumanu, ADB funded bridge contracts, APEC spending, the National Housing Corporation rorts, health spending, Cloudy Bay Forestry, KPPA and Woodlark Island logging, the list of scams just gets longer and longer. Perhaps it should be no surprise therefore, that in 2019, the government is set to continue its shocking under-funding of our key anti-corruption agencies and is still stalling on the establishment of the promised Independent Commission Against Corruption (ICAC). This year, 2019, the PNG government will give the police band more money to pay for musicians and musical instruments, than it will give to both the police Fraud and Anti-corruption squad and the Bank of PNG’s Financial Analysis and Supervision Unit (FASU). The police band will receive K1.3 million while FASU will receive just under K300,000 and the Fraud Squad will get K670,000. 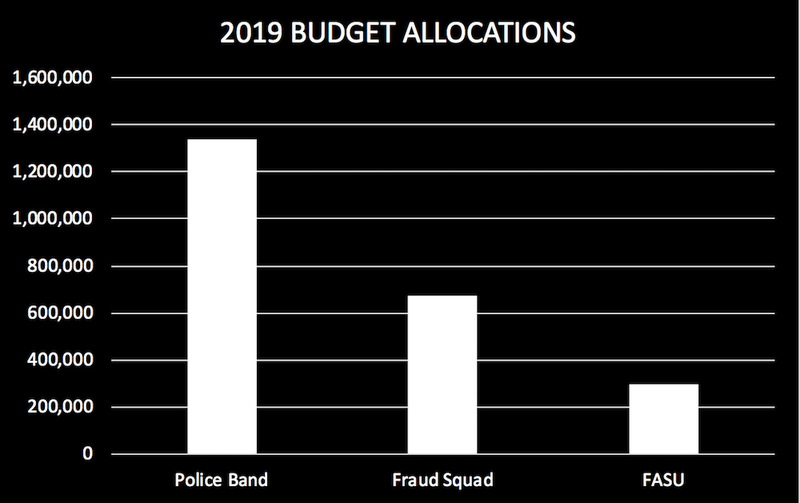 The money allocated to the Fraud Squad for 2019 is slightly less than in 2018 and a whopping 65% less than its allocation in 2016, as shown in the graph below. 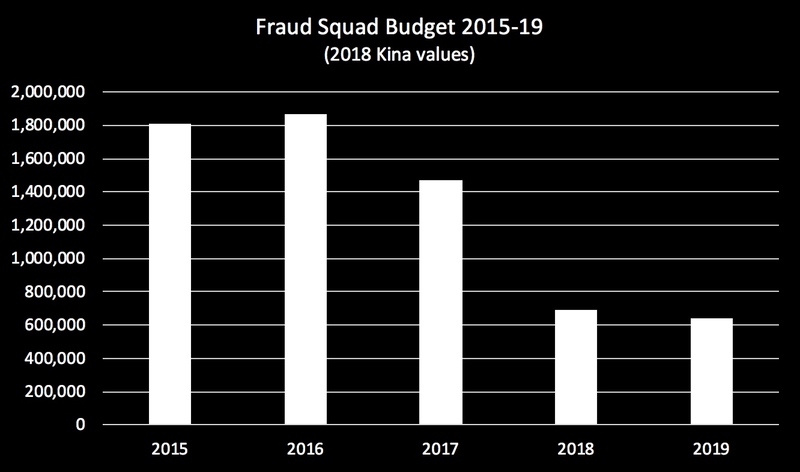 The drop in Fraud Squad funding is despite the government’s overall allocation to the police increasing by 19%, or K50 million, in 2019. And don’t expect the long-awaited Independent Commission Against Corruption to take up the slack. For 2019, the budget allocation for the repeatedly promised, but still illusory, ICAC is just K400,000 (20% less than in 2018). Looking more broadly at all the organisations tasked with directly tackling corruption, which also include the Ombudsman Commission, the Auditor-General’s Office, the EITI and the interim-ICAC, the picture is no better. 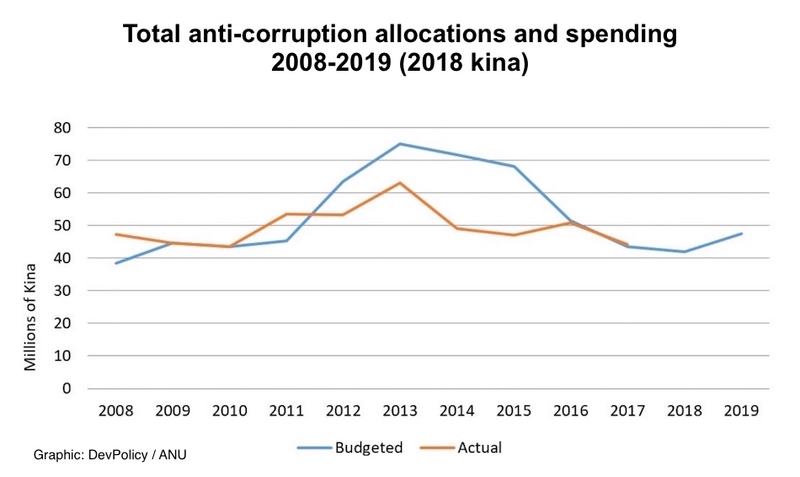 Although the OC will receive a 23% increase in 2019 and the AGO 7% more, between 2013 and 2019, the six anti-corruption organisations taken together have seen their funding cut by 56% in real terms, as shown in the graph below from Grant Walton and Husnia Hushang at the Australian National University. Compounding the situation, between 2008 and 2017 these six organisations failed to receive K49 million that the government promised for their operations. The 2019 budget “leaves PNG’s most potent anti-corruption agencies under-funded and under-resourced, which is exactly what some of PNG’s political elites want”. Figures quoted are from an article published on the DevPolicy blog in December 2018.